Yu Yureka Plus is the third addition to the smartphone portfolio of YU- a Micromax subsidiary. The phone has been launched at a price of Rs. 9,999 and runs on pretty much the same hardware as the original YU Yureka except a few hardware changes. With this launch YU targets the very lucrative price segment of close to Rs. 10,000. Lenovo recently launched their latest phablet offering, the Lenovo K3 Note in this price bracket a few days back. The K3 Note also costs Rs. 9,999 and runs on octa-core MediaTek chip along with 2 GB RAM and boots Android Lollipop OS out of the box. Both YU Yureka Plus and Lenovo K3 Note offer similar hardware configuration and costs Rs. 9,999 each. So, in order to make your buying decision easy, let’s take a look at the detailed hardware comparison of each of these phones. Both Yu Yureka Plus and Lenovo K3 Note are recently announced phones with revised hardware and features, but we have also taken the original YU Yureka into the comparison to give you a clear picture of what you can get by paying Rs. 1,000 over the price tag of YU Yureka. YU Yureka features a 5.5″ IPS HD display as compared to FHD display of the Yureka Plus and K3 Note, but it also costs Rs. 1,000 less than both these phones. It also features Sony IMX135 camera sensor as compared to the more advanced IMX214 sensor on the Yureka Plus. The rest of the hardware remains the same for Yureka and Yureka Plus. YU Yureka Plus runs on octa-core Snapdragon 615 (1 GHz quad-core + 1.7 GHz quad-core along with Adreno 405 GPU) whereas the Lenovo K3 Note runs on MediaTek MT6752 (with Mali-T760MP2 GPU) having all its 8 CPU cores ticking at 1.7 GHz. Both phones also have 2 GB RAM for fluid multi-tasking. But keeping the sheer processing power in mind, I’d prefer Lenovo K3 Note over the YU Yureka Plus. YU Yureka Plus and K3 Note both have 16 GB ROM along with support for microSD cards up to 32 GB. That makes them even and good enough for running Android Lollipop with a lot of apps installed. Both phones also feature 13 MP rear AF camera coupled with a 5 MP front shooter for taking selfies. Yureka Plus sports an LED flash at the back whereas the K3 Note features a dual-LED flash at the back. Since Lenovo phones usually have a good camera and the Yu Yureka Plus has a very good camera sensor from Sony, we can’t predict whose camera would be better. But rest assured, whichever phone you’ll choose to buy, it will have a good camera for daily photography needs. Both feature 5.5 inch IPS Full HD displays (1080×1920 pixels) with the only difference that Yureka Plus features a scratch-resistant Gorilla Glass 3 sheet over the display. However, the absence of GG3 shouldn’t affect your buying decision since you would anyway be installing a tempered glass screen guard over the display of your phone for protection against cracks and scratches. YU Yureka Plus runs on CM12 version of Android Lollipop with some extra CyanogenMod goodies. It should also be noted all CM OS running phones would receive latest OS updates for a significant amount of time which is usually greater than what the phone manufacturers generally provide. K3 Note also runs on Android Lollipop along with Lenovo Vibe UI 2.0 on top. Yureka Plus is powered by a 2500 mAh Li-Po battery as compared to the 3000 mAh Li-ion battery in the K3 Note. Now since both phones feature similar resolution displays and processors, Lenovo K3 Note should offer greater battery backup than the YU Yureka Plus. Yureka Plus and Lenovo K3 Note both come at a price tag of Rs. 9,999 each and offer almost similar connectivity options so choosing one over the other would be matter of personal requirements and taste. At the time of writing of this article, YU Yureka was out of stock on Amazon. Also we would recommend you to go with either YU Yureka Plus or Lenovo K3 Note. As it has become the tradition of selling the latest phones in flash sales via exclusive online stores, YU Yureka Plus will be available only on Amazon.in. Its first sale will held on 24 July at 12:00 pm. So, if you want to buy the phone on that day, then you have to register first for participating in the flash sale. On the other hand, if you feel convinced to get the Lenovo K3 Note then Register here for participating in its next flash sale (on 22 July) on Flipkart. 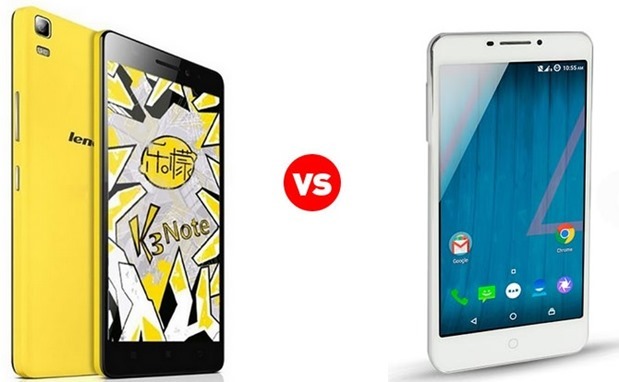 "Yu Yureka Plus Vs Lenovo K3 Note – Which One Should You Buy? [Detailed Comparison]", 2 out of 5 based on 3 ratings. here mentioned yu yureka plus is Rs. 1000/- less according to price of mobiles. As of now lenovo k3 note is Rs.1000/- less. Starting yu yureka plus has given mobile for Rs.8999/- through amazon.in, now with other sites they are selling the same mobile for Rs. 10999/- and 12000/- like that. Creating hype like this and creating unnecessary demand for this product. I am already yu yureka user. But this mobile always switch off automatically without intimation. Due to this cheating today i have purchased lenovo k3 note. This company gaming with the mindset of people. Don’t encourage such type of product and companies in future. They are cheating. Considering that the K3 Note is a little bit faster than the Yureka Plus and has bigger battery, the K3 Note seems like a better buy, as long as you can deal with chinese bloatware apps (which can be uninstalled with root). I think buyer should go with lenovo. I have used both micromax and lanova. Lenovo is too good for use.